59-room hotel, indoor heated pool, fitness center, full breakfast, onsite meeting room seats 50, off-site meeting/banquet facility seats 100. Brand new in October 2014! Conveniently located off of highways 69 & 54, Sleep Inn & Suites hotel is a 5-minute walk from downtown and the Fort Scott National Historic Site. Each room has an HDTV, refrigerator, microwave, coffee maker and premium bedding which makes any short or long stay feel like home. 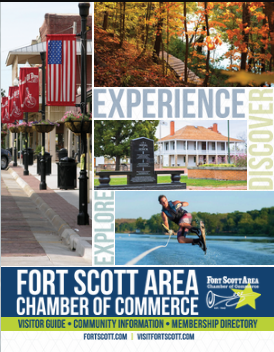 Located at the junction of US Highways 54 and 69, adjacent to the Chamber/Tourism Center and the Fort Scott National Historic Site in the heart of Fort Scott's Downtown Historic District.